Memory, heritage and the Public Interest reports on a conference aimed at exploring the refiguration, utilisation and improved accessibility of archives in South Africa. 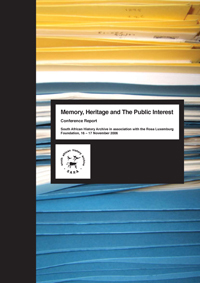 Hosted by SAHA in association with the Rosa Luxemburg Foundation on 16 – 17 November 2006, the conference brought together heritage, museum, archival and educational practitioners to discuss what work is taken place to promote access to historical information and facilitate the emergence of new historiographies. Available in print and PDF from SAHA.